Yes, it did snow here in the early morning hours. But it did not stay. this is my Spring stuff. I do realize that we can still get creamed with a glorious batch of snow. I am just so ready for lighter colors. I have been pulling all the Spring decorations out. So here is my Spring sideboard. that is a bunny on my table! of course I put him out already. layered an old, chippy framed mirror next. Why bother taking all the old coats of gold paint off. 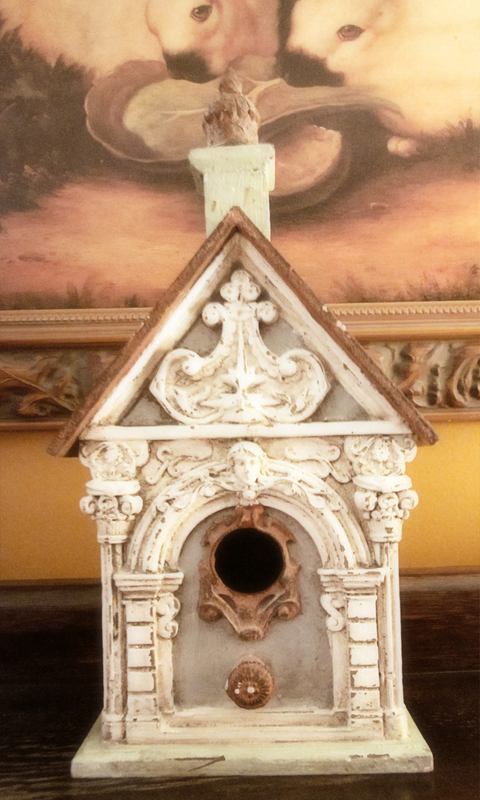 The birds need a chapel, too. and a nest with moss. There were pieces of a robins egg. or it just didn't find its way back to the nest. See how nice the sun is shining? none of the french doors were here. Seven doors for fifty dollars! We painted them a glossy black...very English Cottage! I hope you enjoyed the beginning of the Spring redo. then join me on these dates. to find all the details. for featuring my Winter Sideboard post. 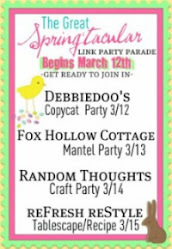 I will be linking to these fun parties. You ladies are so very kind! 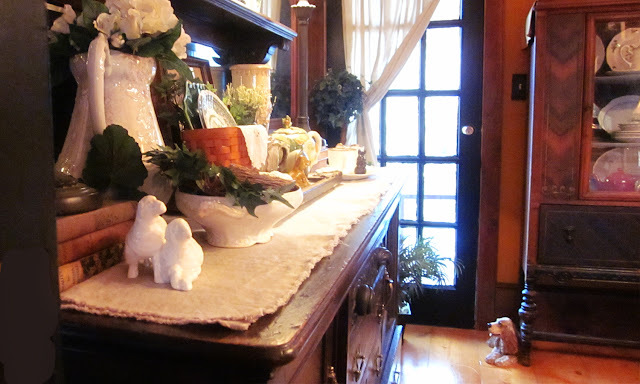 Your sideboard looks beautiful, Audrey! 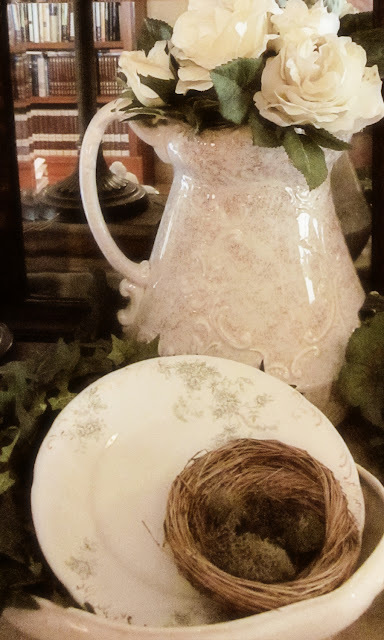 All the pretty green & white make for a lovely springtime vignette and you always use pretty & interesting items. Thanks for the party shout-out! Beautiful and serene vignette. Love the bunny on the table, mine will be coming out soon. Those doors are gorgeous, need some in my house lol! First of all, I adore your sideboard! What a charming piece of furniture. ANd I love your sweet Spring display that you have on top of it!! Lovely set up.What a steal on those doors.I get excited when I see a vintage door for 50.00 a piece.I think your deal is better. Beautiful vignettes you have created. I adore French doors and you really scored on yours. 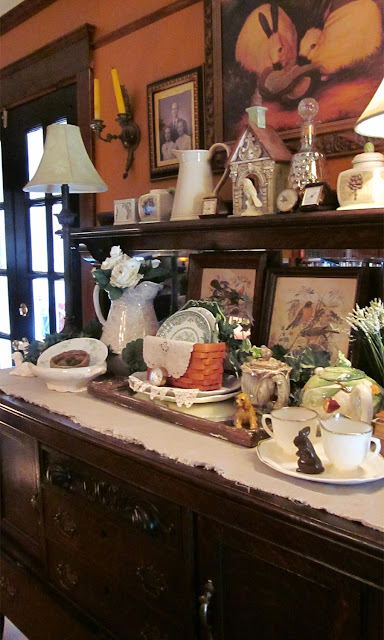 I love your sideboard, just love it and you do great vignettes. So pretty, I don't think I have the knack! but get inspired from you. Thanks for sharing your creative inspiration at Sunday's Best Par.Tay! Hi Audrey, Wonderful! There isn't a thing in this gorgeous post that I don't love. This is really lovely, Audrey! I love everything you've used here and you've incorporated some of my favorite elements and colors. I love your blog and I'm your newest follower! We have similar taste for sure. Nothing wrong with getting out the spring stuff, especially when it's close to 70 today. Your displays look so nice and fresh. Always love your sideboard, Audrey, in all seasons! Well done! Truly enjoyed your spring sideboard. Love all the ironstone and white flowers against the dark woods. The arrangement on your sideboard is just beautiful! Love seeing all of your sweet things. Your photography is very nice too! Your sideboard arrangement is just lovely. 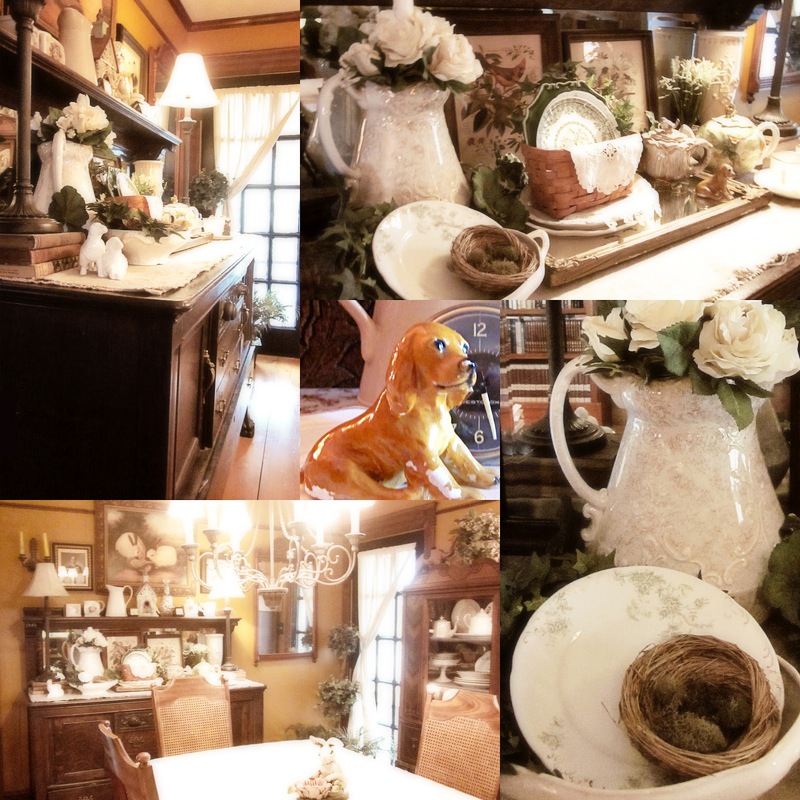 Beautiful vignettes on your spring sideboard, Audrey. A lovely sideboard. Love all your things. 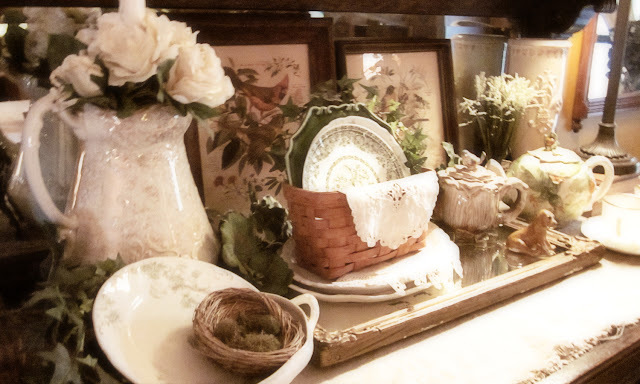 Your Spring sideboard vignette is so pretty. 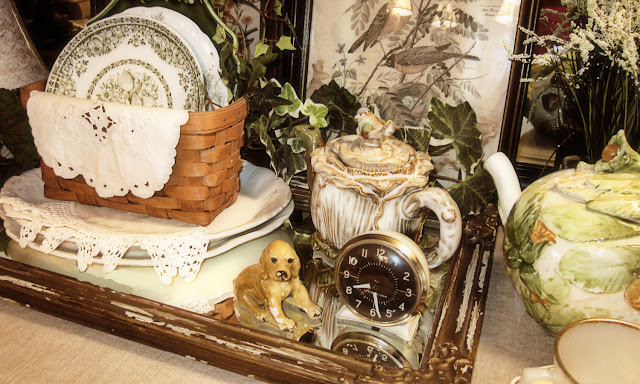 Love the bird prints and basket with the transferware. Happy Spring. Wow, I love that sideboard. Your springy arrangement is so pretty. Great dog! Your sideboard is gorgeous, Audrey! I love the way you mix elements in your vignettes! Stunning! The attention to detail is fantastic! Thanks so much for linking up to Cowgirl Up! Hope to see you again next week! 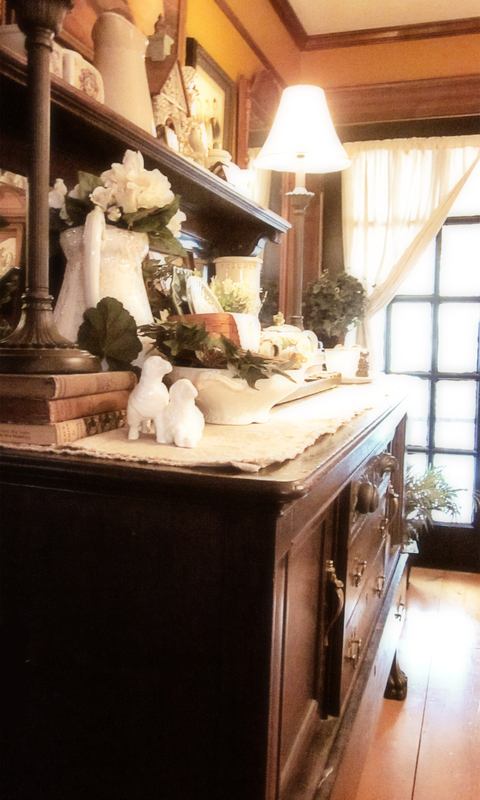 I love the elegance of your sideboard vignette. So many pretty pieces....but that little puppy stole my heart. Love him. 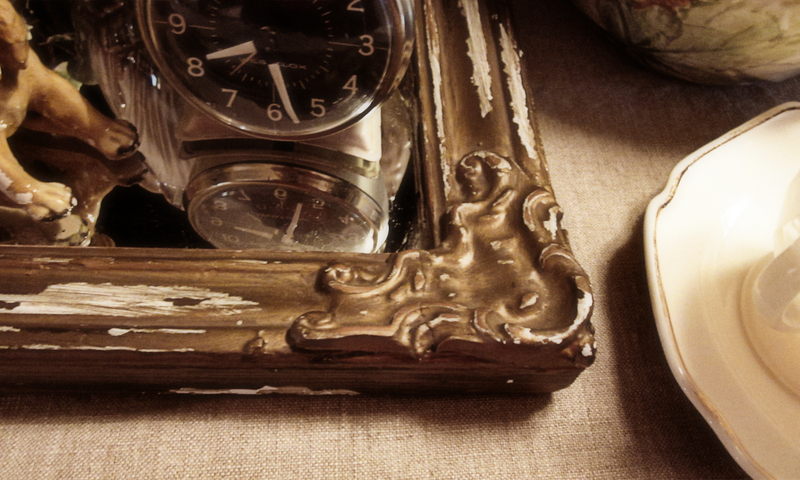 Such a serene scene around your sideboard. So interesting about your doors - they are gorgeous! Loving your sideboard and how you layered the pieces. It looks grand! Your sideboard is so ready for spring...so am I quite frankly but yes if it did snow I would love that too! Beautiful post Audrey...thank you for sharing! Hi Audrey! I think you did a bang up job on that! The pieces all work together to make a feast for the eyes!! LOVE the sheep and puppy....and that little chapel is adorable! Great job! 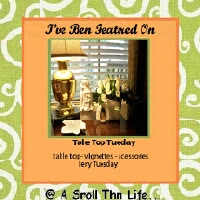 Thanks so much for linking up with me for Pearls and Lace Thursday! Your sideboard is very pretty! I love looking at all your pretties.......It all says "Welcome Spring". I'm loving your side board. I haven't gotten to change things up in my home yet, but I did change my header on my blog which reminds me of your Spring side board! Come check it out. I'd also love to have you come join me for Seasonal Sundays. Thank you for sharing at Potpourri Friday at 2805! Hi Audrey, your sideboard is wonderful, love all your Spring touches! and those french doors are just amazing. thanks so much for linking up to VIF! 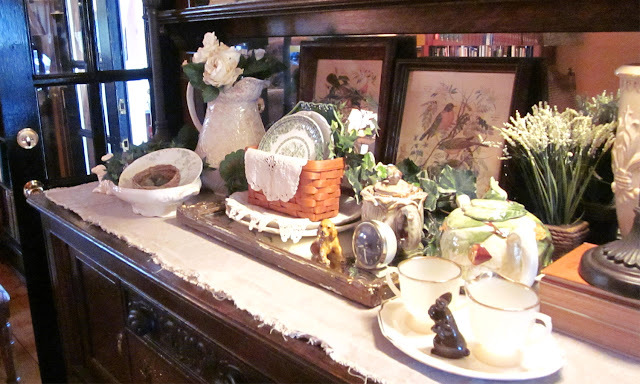 Oh, I see so many wonderful spring treasures layered atop your sideboard, Audrey! 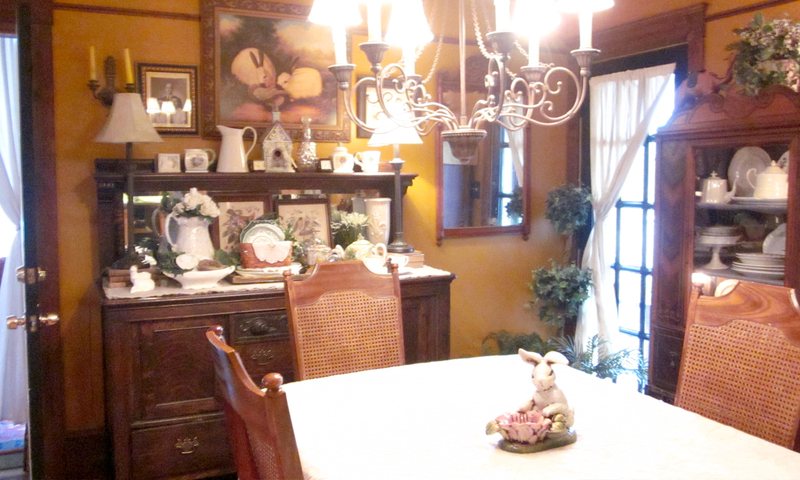 And, once upon a time, I had a copy of the same rabbit painting - different frame - displayed above a chest in my living room. It was one of my favorites. 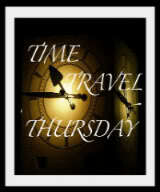 Thanks for linking to Time Travel Thursday again. Hope to see you this week, as well. I believe home should be a sanctuary. A safe place where you and your family can be comfortable. 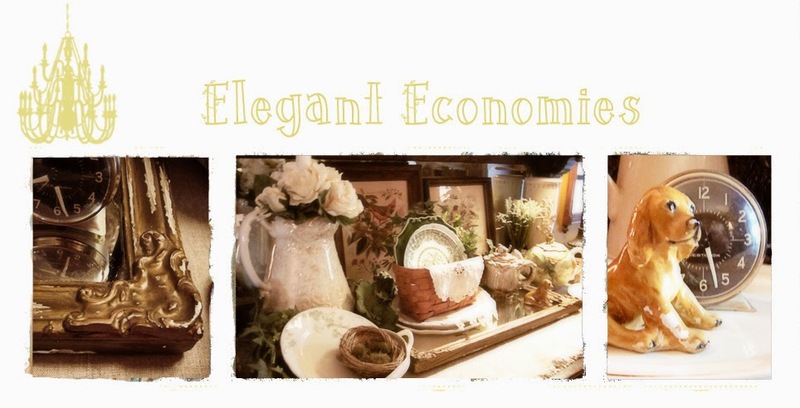 You can provide that "sense of place" without breaking the bank! My sweetheart and I work together to make our home welcoming and fun. 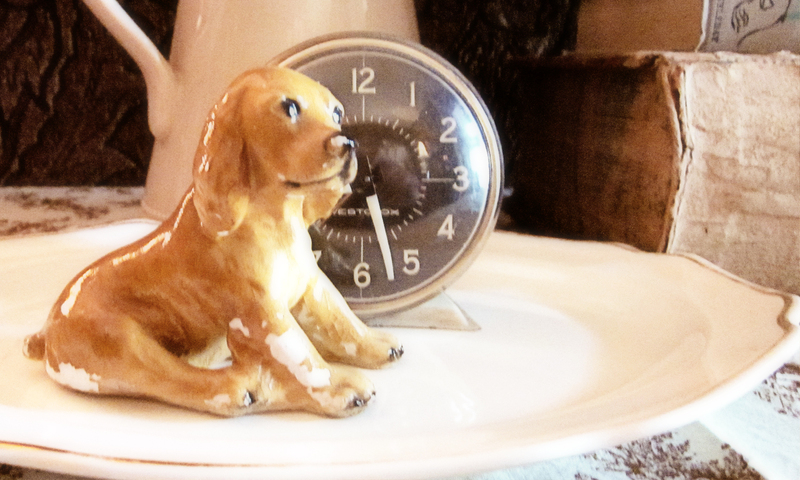 We make loads of stuff, go to flea markets, re-cycle, up-cycle and free-cycle! We love each other, our family and most of all....we love God! Won't you join us on our journey? ours are the hands with which he blesses his people." Unless otherwise noted, all photos and text on this blog belong to me. 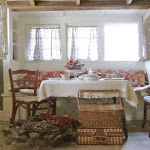 You may share photos from this blog if linked back to their original posts and for the sole purpose of featuring my work. I'd really like to keep all my text on my blog, so please do not copy it. Tutorials and recipes are for personal use only. Thank You! Most of the images on this blog are mine,please don't copy.Audrey. Simple theme. Powered by Blogger.